Some couples go to lovely romantic island resorts on vacation. Glen and I chose Cleveland. I’ve mentioned before that our master plan is to visit all 50 states together. 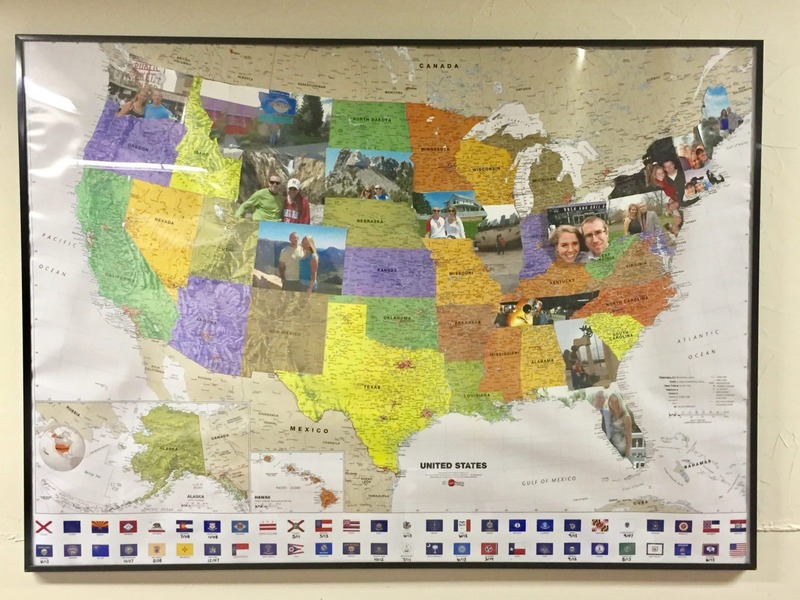 We even have a huge map in our basement that has pictures of us canoodling in each state we’ve been to cut into the shape of the state. Even as an active participant in this marriage this whole thing grosses me out. We’ve officially taken “cute and coupley” to a barf inducing level. But don’t worry, we don’t hold hands very much, so at least there’s that. And if you think this idea is actually precious, Pin It! To help achieve our goal, we try to visit a new state each year. Or at least the years when I haven’t recently birthed a child. We’ve covered the Northeast using this strategy and have lots of pictures of the two of us surrounded by lighthouses and fall foliage as proof. We then covered a decent section of the Northwest during our road trip, adding in more pictures of us surrounded by natural beauty and American landmarks. Our picture map makes us look so much cooler than we are considering 90% of our time is now spent doing laundry and the other 10% is spent playing backgammon. When Jack was 6 months old, we found out that I was pregnant with Norah. So we had a window of about 7 months to sneak in one more “the two of us out gallivanting as a couple” trip before I was incredibly large and in charge/ 125% of our money started going towards a double daycare bill. So we looked at the Southwest schedules to find the cheapest flight to somewhere in the US we had never been. And then cross checked flights against the Broncos’ football schedule to see if we could get Glen to an away game for his birthday and still afford to buy Jack the organic baby food proven to make him jump higher and run faster. And looked for a weekend my saintly parents would be available for baby cuddles and early morning wake up calls. The answer: October in Cleveland. There would be fewer cabanas and virgin daiquiris in Cleveland than I would like. And walking around barefoot would likely be frowned upon. But, hey, an adventure is an adventure. And as long as we had each other, anywhere could be paradise! Ugh, gross, barf, delete. Before really considering a trip to Cleveland, all I knew about it was that Drew Carey thought it rocked. But it turns out the Rock and Roll Hall of Fame is there. Which is maybe where the song comes from… Aw, people are clever! We like music and looking at things, so it seemed like a good fit. And it totally was. 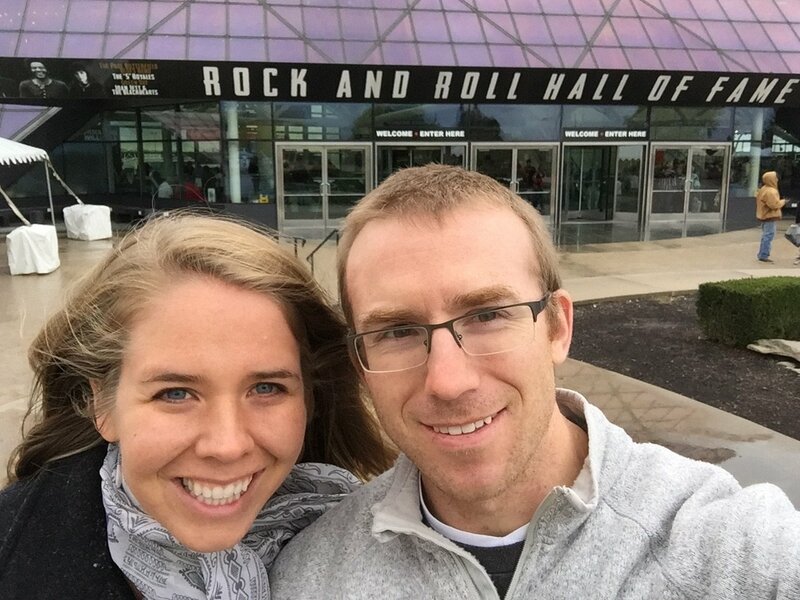 If you haven’t been to the Rock and Roll Hall of Fame and you find yourself also gallivanting in Cleveland, definitely give yourself half a day to explore. From the early influencers of rock, to the highly flexible hips of Elvis, to TSwift’s transition from country sweetheart to “girl… is everything okay?”, the museum has it covered. They don’t let you try on the costumes though, which is kind of a bummer. I would have SLAYED in some Beyonce. Or more realistically, some modern day Elton John. 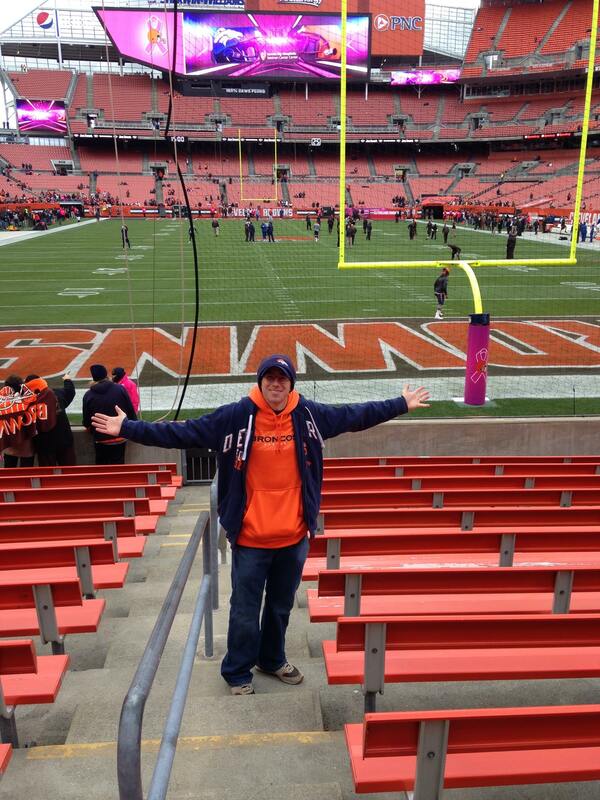 Our other big Cleveland outing was to FirstEnergy Stadium for the Broncos vs. Browns game. Remember the good old days when stadiums were named after teams or places instead of companies? Remember how I’ll be coming back to delete that sentence the first time I do a sponsored blog post and am filled with instant regret that I once downplayed the significance of sponsorship? Me too! Yay FirstEnergy/Gillette/Sports Authority! This was my first NFL “away game” and it was super weird. I was wearing a Broncos hat in spousal solidarity and Glen was decked out in full Denver gear. Walking through the streets we were met with angry glares from serious Clevelanders, and light hearted “hey, get out of our town” taunts from less serious Clevelanders, and a “sorry ma’am, we’re not open” at the Subway we tried to buy breakfast from. I don’t think that last part was related though. In a sea of Browns jerseys, we stuck out like sore thumbs and I almost considered switching team loyalty at least 4 or 5 times because apparently I’m incredibly insecure. But I held strong for my marriage. Although I did secretly high five the couple behind us a few times when the Browns made a good play. You know, for sportsmanship. The Broncos pulled off a win in overtime for Glen’s birthday, which was very considerate. And no angry Clevelanders threw stuff at us, also very considerate. All in all, I give Cleveland 4.5 stars for kindness. And 5 stars for music museums. And 2 stars for their daiquiris. You can’t win em all. 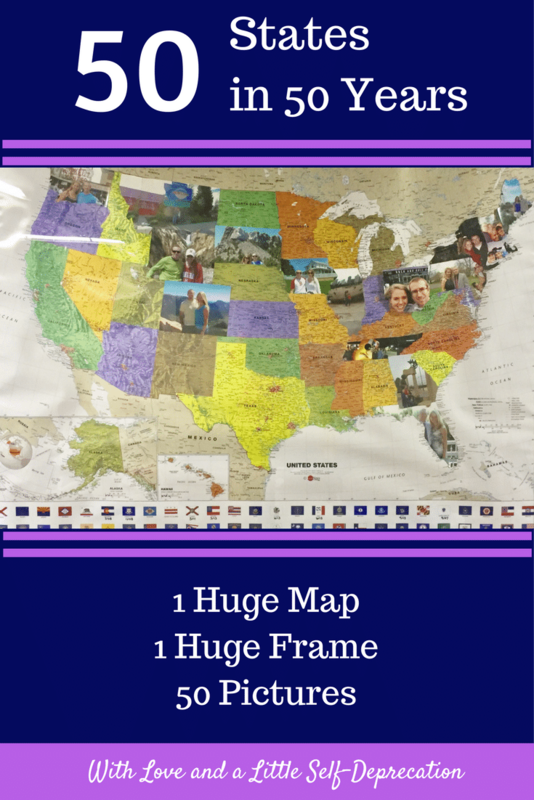 I LOVE the idea of visiting all 50 states! My husband actually wants to visit all 32 NFL stadiums. (Is it still 32? 31? Whatever.) He often goes to a new one each year with a likeminded friend, but sometimes I get crafty. I used to plan vacations for myself around the Jags away schedule. Nashville was a fun one but my fave was putting the Grand Canyon trip with the Jags in Phoenix. I’ve always wanted to visit the Grand Canyon. I’m a genius lol. Stadium trips have been put on temporary hold while the ToddlerMonster grows a bit. Brilliant! On all counts. Too bad there isn’t a stadium in West Virginia. Really at a loss as to what to do there. I think the only cool thing in WV is Dorothy’s house from the Wizard of Oz. Seriously! My parents stayed there. It’s a real thing! Also. Are those FAIRYTALE BROWNIES!? They ARE legit! We haven’t been to Wisconsin but going during football season sounds like an excellent idea. You have room on your couch for two random people from Massachusetts right? Oh yeah, sure. As long as you’re good with a 10 year old that talks non-stop, her much quieter sister and you like cheese and craft beer. ^^ I second that. I am a huge Packer fan (my mom is from there, and we lived there for 7y). WI is kinda neat overall. Really cool concept for bonding and dates – especially travel dates! A.) I LOVE this idea! Such a great way to put purpose to your trips and incentivize you to actually make sure they happen. B.) That map with the pictures is ALL the cute! What a great idea! Especially, Cleveland (I say as a Cleveland native)! Totally gotcha about the daiquiris, but the Rock Hall is cool, right? Coming to this post super late–but glad I found it. Happy almost 2018!